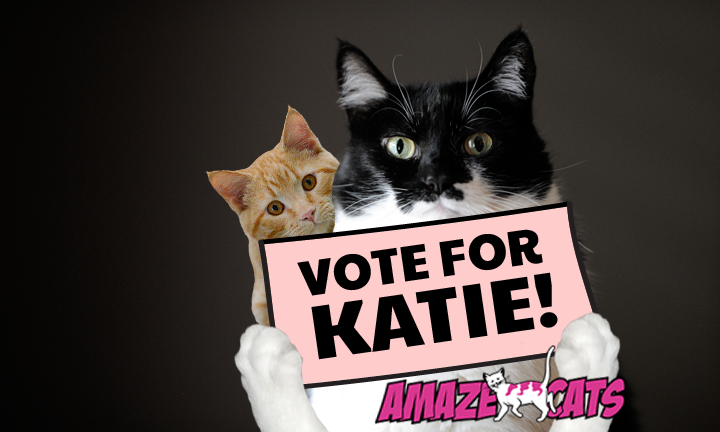 GLOGIRLY: VOTE KATIE for AmazeCats Next Top Cat! 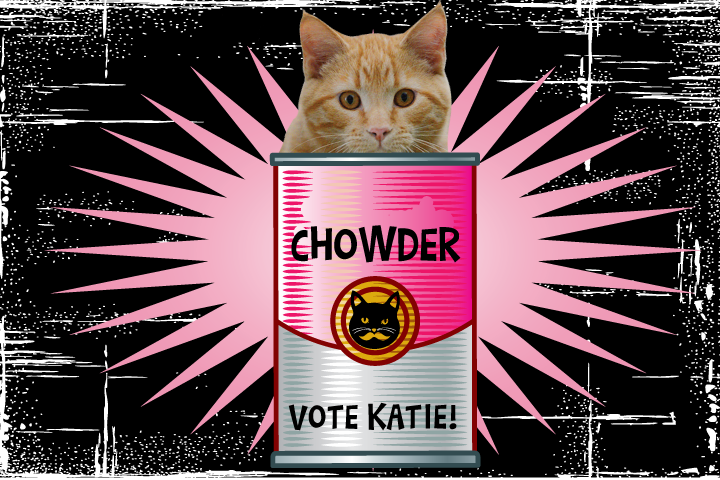 Today's the day to vote for the Boss, um I mean Katie, um I mean the Boss. The Boss is in a cat chowder, I mean clowder, with 4 other cats. At least one of them is SUPER famous. More famous than the Boss, but you didn't hear that from me. So please click the button thingy next to her name on the AmazeCats Facebook Page. She said I could finish her breakfast if I ask everyone nicely. CLICK HERE TO VOTE KATIE FOR NEXT TOP CAT! Um, do you have any of those little round oyster crackers? Pee S: The Boss' *boyfriend* Spaghetti Bob is in one of the other cat clowders so please won't you CLICK HIS BUTTON too? Oh we will head over to vote! good luck! I will be sure to vote for you tomorrow. It is not open now. I WILL NOT FORGET! Oh noes! I can't find you??? Maybe tomorrow??? I pinky swear (can we do that? I forget--maybe dew claw swear? do claw? due claw) I need to put down the Niptini. We can't see you there Katie! We'll try tomorrow! We'll find you tomorrow, too. It will probably be open then. Good luck, sweet tuxie girl! It officially opens at 10 AM Eastern Time, I believe. I have a blog post for you (and Spaghetti-Bob) scheduled to go live at 10:30, urging my readers to vote for you! We voted. Have a wonderful Wednesday. We wish you lots of luck Glogirly. Thanks so much for the nice birthday wishes. Hope all of you have a great day. We will vote after 10:30. Please help us remember! Good luck, Katie00we can't wait to see where you are at the end of the day! We went over but see that it's not time to vote yet. We'll go back and vote later! you know we are!!! I am sure it will be a MUCH more exciting race than yesterday's....that one was a total DUD! BTW...be sure to add your DIRECT LINK...when they post it......we have a blog post ready to go too as soon as your specific link is up! Good luck Katie. Voted for you. we used our mom's account to vote! Someone taught me the other day. we R still votin for ewe and sum bowls oh chowder in R minds waffles...best fishes! oh my cat! so glad I read this before it's too late! we voted and we threatened everyone that didn't vote for Katie that W2 would personally come and 'take a bite outta them." You're welcome. Voted for you Katie & Spaghetti Bob!!! & we shared & posted everywhere-GL!!! ~Raine~ and the crew!